Our preparations are well underway for the start-of-season showcase – the Caravan, Camping and Motorhome Show 2017 – including our Crack the Safe competition! 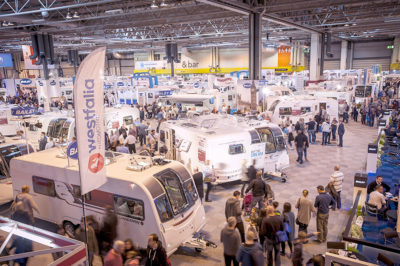 Taking place at Birmingham’s NEC from Feb 21st to February 26th, there’ll be hundreds of caravans, motorhomes, tents, camping equipment and accessories on show and all under one roof. You’ll find our Caravan Guard advisers on stand 12-07, ready to answer your queries about our caravan or motorhome insurance cover. Plus visitors to our stand can have a go at cracking our safe for a chance to win £500. To enter the competition, visitors simply enter their own unique three digit code. At October’s show we had two lucky £500 winners and plenty walking away with runners up prizes! We’ll be tweeting winners using #crackthesafe and posting regular updates on the Caravan Guard Facebook page. 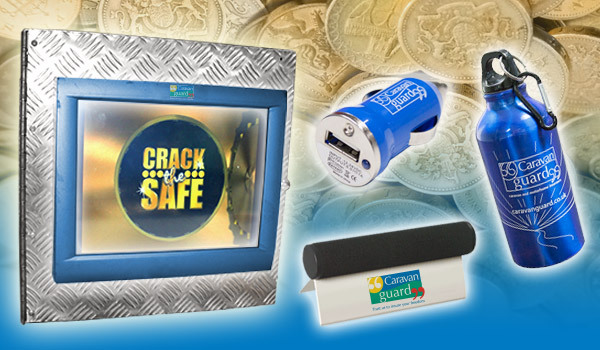 We also have some great new runner-up prizes to give away throughout the show for those who can’t crack the code – as randomly chosen by our clever electronic safe! Looking for great insurance cover for your caravan, motorhome or campervan…? We’ll be offering a fantastic 20% discount on new touring caravan policies and £10 off new motorhome insurance policies throughout the show, on top of our great safety and security discounts for the careful caravanner. * So if you want to talk to us about our 5 Star Defaqto rated caravan insurance cover or great value motorhome insurance, then you’ll find our friendly team exhibiting from Tuesday, February 21st to Sunday, February 26th. If no-one wins our Crack the Safe competition, we’ll choose a £500 prize winner at random and announce who’s won by March 31st, 2017. For more information about the Caravan, Camping and Motorhome Show 2017 and to book advance tickets visit www.ccmshow.co.uk. You can also follow the show on Twitter or like on Facebook. *20% touring caravan insurance discount includes 10% new policy discount plus Caravan Guard’s ‘club’ discount. Club discount can only be claimed once per policy term. 20% off and the £10 off motorhome insurance are available on new policies only – offers are not available in conjunction with other offers and end 30/6/18. Minimum premiums apply. I clicked on 2 star, and 3 came up, another dirty trick. Hi Eric, I’ve checked and your two star rating has definitely been logged and accepted. You will have then seen the average score based on the rating other readers have given the article. So the average score is currently 3.3. Thank you taking the time to vote and comment. Advance ticket prices £7 senior (0ver 60s) and £8 adult when booking before 23:59hrs 20/02/2017 after which time prices revert to the on-the-door prices of £9 Senior and £10 Adult. Appears to me like blackmail, especially with such a short cut off time. I never respond to blackmail by buying. Hi Eric, we don’t set the ticket prices. These are set by the Caravan, Camping and Motorhome Show. They offer a small discount if you buy before the show starts.